It’s true that as a woman, you are at greater risk of assault and attempted assaults. It’s also true that you are at an inherent disadvantage physically when it is the opposite gender attacking. Karate training can reverse those hard facts by tapping into a woman’s strengths. First of all, the exercise and strength training that karate provides will increase a woman’s strength. 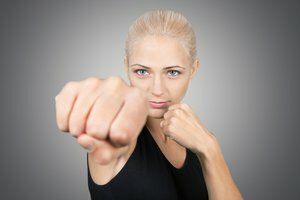 Secondly, and perhaps even more importantly, self-defense training will teach a woman how to leverage her strength, her skills, and her training against someone who is likely to be bigger and stronger. Oftentimes, the first step to deterring an attack is the simple awareness of an attack about to happen, and being able to deflect it. Most times, 1 or 2 simple moves will discourage an attacker. Oftentimes, contact can be avoided altogether by the woman’s confident stance and her readiness to defend herself.Another important aspect of strategy is to be prepared for unexpected situations. Karate training can teach you how to recognize potential threats in a split second, even in situations where you would assume you are safe. Training can help you develop an automatic response to attacks, so even if it is unexpected, your training will respond to help keep you safe. Finally, self-defense training at studios such as Karate Atlanta can help break the disruptive cycle of violence and abuse in women’s lives by turning victims into role models. One woman who undergoes self-defense training can in turn empower dozens or hundreds of other women, including young girls. One woman can break a cycle of abuse in her own family or neighborhood and become an example for other girls.